a couple nights ago, tim had the energy to grill (i was completely spent after a long day of meetings at school). we had some boneless pork ribs, gigantic potatoes, and plenty of zucchini from various family and friends’ gardens. we threw the pork ribs in a bowl with olive oil and a bunch of salt and pepper and let them sit a while before putting them on the grill. likewise, the zucchini got cut into spears and was put in a bowl with olive oil, balsamic vinegar, salt, pepper, and italian seasoning and left to marinate. the potatoes were just wrapped up in foil and thrown right on the grill. the grilling part is pretty simple, and something we repeat pretty often with various cuts of meat. tim grills the pork on pretty high heat until the outside is nicely seared, flipping as needed. then, he bastes it with some sauce (today it was barbecue sauce, which i secretly adorned with a little honey and a little bacon fat–we’re not trying to grill healthy here!). he continues basting on each side until the pork is completely done and the sauce becomes a sticky glaze. the potatoes came off the grill when they felt squishy under the tongs, and the zucchini only needs to go on long enough to get a little seared and slightly “bendy” (i don’t know why but i can’t think of a single other word at the moment). 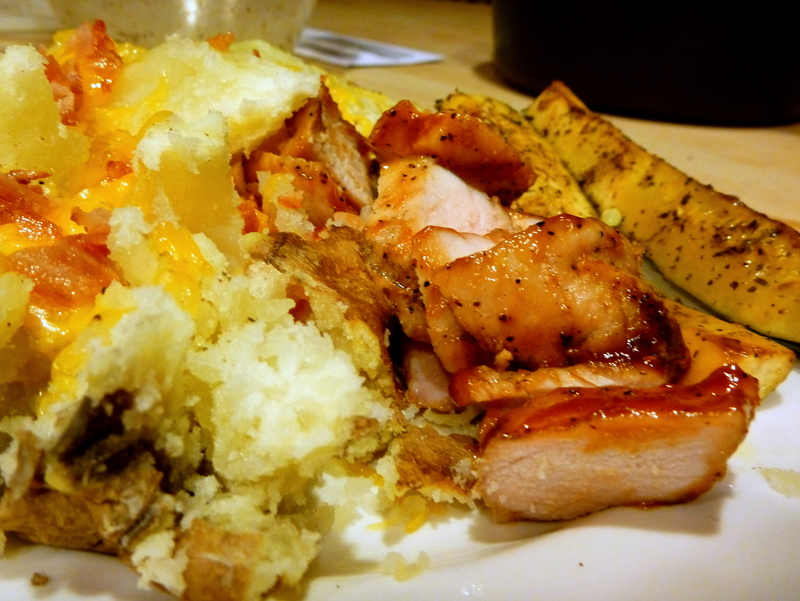 it was quite a feast, after we opened up the potatoes and covered them in butter, bacon, cheese, salt, and pepper. didn’t even come close to finishing the plate but now i have lunch today! ~ by agent229 on August 18, 2010. Sounds delicious! We’ve got lots of peaches for you and a recipe that was in the paper for grilled pork tenderloin and peaches.